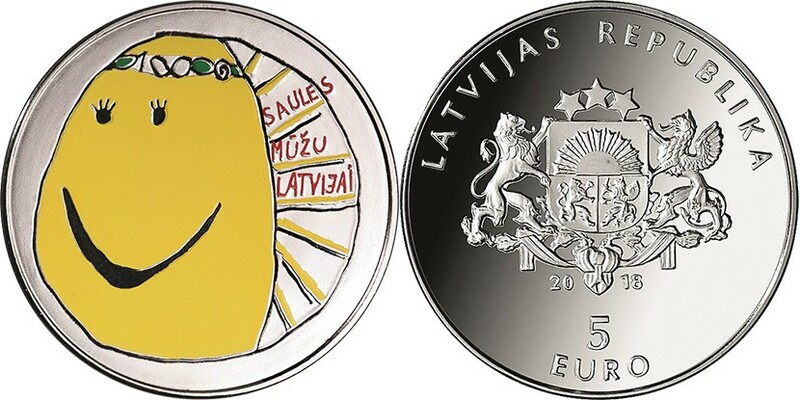 On Friday, 9th of March, Latvijas Banka issued a new silver collector coin "My Latvia". The large coat of arms of the Republic of Latvia, with the year 2018 inscribed beneath, is placed in the centre. The inscription LATVIJAS REPUBLIKA, arranged in a semicircle, is above the central motif. The inscription EURO, topped with the numeral 5, are placed beneath the central motif. A drawing of a smiling sun is featured on the reverse, with the inscription SAULES MŪŽU LATVIJAI (May Latvia live and prosper forever) to the right. The Sun, a source of all life on Earth, a symbol of kindness, the core of human being and its basic value, is the nucleus in numerous Latvian folk songs. The image of the Sun has been extremely inventively interpreted in the drawing by a 10-year old schoolgirl, submitted to the children's open coin design contest recording 6 742 participants, which Latvijas Banka organised to honour the 100th anniversary of the Republic of Latvia. The contest under the motto "My Latvia" was held over the end of 2016–the beginning of 2017 period. Over 10 000 drawings were presented. Due to subtly nuanced presentations, the works of 19 young authors were selected for awards, while the winner was Elizabete Kandere, a girl from the County of Grobiņa. It was her drawing of the Sun that was made into the design of the new euro coin because of its charming optimism and buoyancy. The Sun's passage resembles that of a cheese wheel, it is shining bright as an amber bead... Moreover, the image is enhanced with monumentality and uniqueness via its spontaneous modernism and sincere well-wishing "May Latvia live and prosper forever!". Every true patriot and well-disposed person lucky enough to have this Latvijas Banka's coin will definitely subscribe to this wish. Similar practice of children's competitions and incorporation of their drawings in coin designs is spreading in many world countries, e.g. Estonia, Bulgaria, Malta and elsewhere. Significance of such drawings is thriving, and they more often than not come up as an artistic surprise. Children's art has been recognised as a noteworthy factor of culture, indirectly related to the Industrial Revolution or Breakthrough of the 18th–19th centuries. Comparatively long chains of interconnections were then forming gradually, with technological, economic, political and social changes intermingling, the bourgeois life style emerging, education and creative and art activities expanding, and more spare time devoted to well-ordered raising of children. The concept "children's drawing" was introduced in 1890 by Franz Čižek (1865–1946), an Austrian painter, art teacher and reformer of education of Check origin. He launched the Child Art Movement in Vienna, and in 1897 opened the Juvenile Art Class, which in 1906 was incorporated into the Arts and Crafts School (the Kunstgewerbeschule), but in 1910 became the Children's Art Class. Young creative personalities usually do not focus much on the tangible environment surrounding them; by means of colours and forms they create symbolic expressions of experienced emotions and ideas of their own. Non-interference on behalf of adults, spontaneity of activities and possibly absolute independence are essential for kids' creativity. Children's art of the 20th century has managed to shatter the monopoly of academic and professional art, this being enhanced by the expansion of modernism and avant-garde movements which opened the doors to the world of relativism in art. Latvian contemporary paintings sometimes reveal trends of children's naïve style due to the connection of adult and children's creativity being mutual and reciprocal. The artistic energy the coin emanates is meant to stir up sincere emotions, the sense of "one's own nest", the feeling of Latvia as the sole place under the Sun where it is cherished with heartfelt devotion even on a rainy day. May Latvia live and prosper forever!